POSITAL’s Wiegand assemblies offer a compact and efficient way of harvesting power for electronic circuits in electromechanical devices, eliminating the need for backup batteries. The operating principle of POSITAL’s Wiegand modules is simple. A “Wiegand wire” is a short length of specially prepared Vicalloy (vanadium-iron-cobalt) wire. When exposed to a changing external magnetic field (e.g. a nearby permanent magnet mounted on a rotating shaft) the Wiegand wire will initially retain its original magnetic polarity, and then abruptly ‘flip’ its polarity when the change to the external magnetic field reaches a certain threshold. This sudden change in the magnetic state of the core induces a current pulse in a copper coil wound around the Vicalloy core. This current pulse is very short-lived, but the energy harvested from the mechanical movement of the magnet can be captured and used to activate a low-power electronic circuit. An important feature of the Wiegand effect is that the amount of electric power generated with each reversal of the magnetic polarization is constant and completely independent of the rate of change of the external magnetic field, even if this happens very slowly. 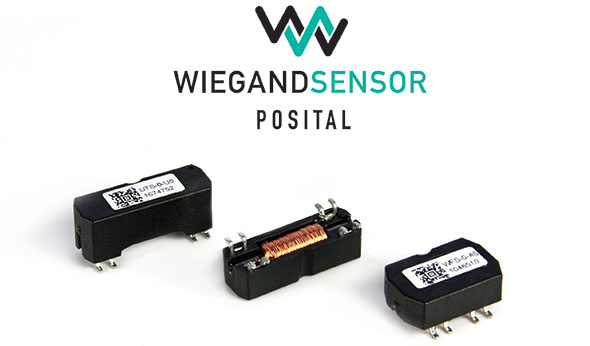 POSITAL Wiegand modules have been used to reliably power rotation counters in tens of millions of devices, including multi-turn rotary encoders, gas and water meters. “The process for making Wiegand wire from raw Vicalloy wire was invented by John Wiegand in the 1970’s” comments Christian Fell, Chief of Technology Development for POSITAL-FRABA. “It involves a complex set of steps, including cold-working the wire through a combination of stretching and twisting, then heat-treating the product to lock in the desired characteristics.” POSITAL acquired the original wire-conditioning machinery and intellectual property from the Wiegand estate in 2013. Fell continues: “This acquisition has meant that we have reliable supply of Wiegand wire. It also gave us an opportunity to refine the manufacturing process for improved product quality. Thanks to our research, we can now produce wires that reliably generate 190 nanojoules of energy at 7 volts with each polarity flip”. Wiegand assemblies are a core component in POSITAL’s IXARC multiturn absolute rotary encoders, providing a maintenance-free method for powering the counter that records the number of complete rotations that the device experiences. POSITAL also offers Wigand assemblies to other manufacturers. These consist of a 15mm length of Wiegand wire surrounded by a copper coil, all contained in an SMD-mountable plastic structure. Wiegand wire production is carried out at locations in the U.S. and Europe, ensuring a stable, reliable supply chain. These assemblies can be used wherever low-cost, zero-maintenance, battery-free energy harvesting systems are needed to energize electronic counters and other low-power electronic devices.